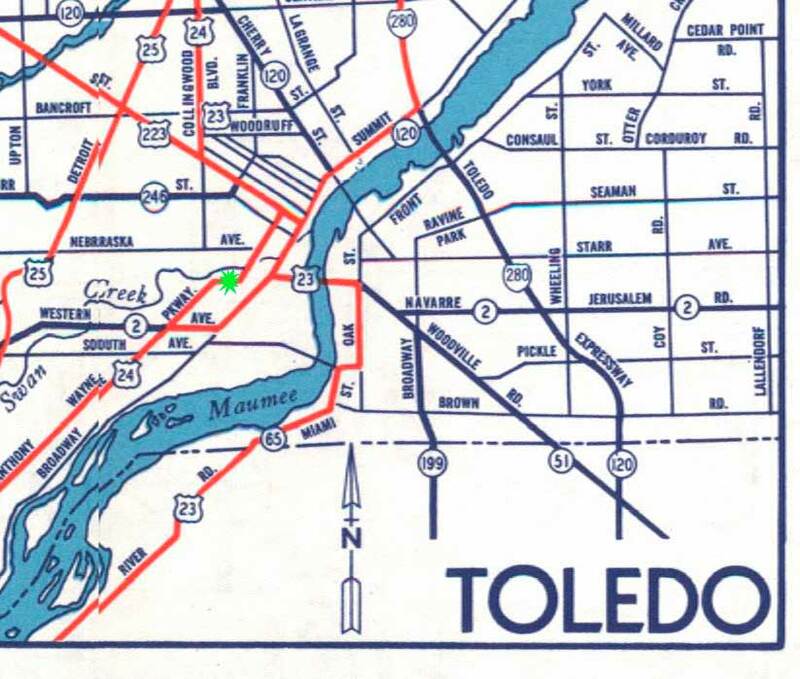 Harold Brandman, a 23-year-old copy clerk for The Blade, was stopped at Logan Street and the Anthony Wayne Trail on a Saturday morning, June 10, 1961, when he heard a loud scraping sound. 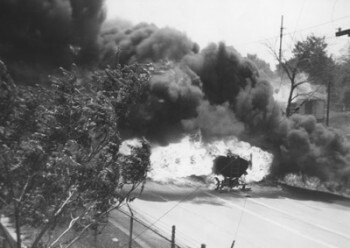 A Standard Oil tanker burns on the Anthony Wayne Trail, June 10, 1966. From the “Images In Time” website of the Toledo Lucas-County Public Library. 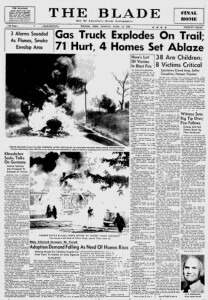 The massive conflagration that followed – nearly 8,000 gallons of gasoline exploding at full force – killed four firefighters, injured 10-15 other firefighters (accounts vary) and injured eighty people overall. At least thirty victims were children, who came from the surrounding neighborhood to watch the truck burn. The explosion shot fire over a wide area. It destroyed two houses on Vinton Street, obliterating a vacant one almost completely, and heavily damaged two others. Flames shot hundreds of feet into the air and sent up black smoke visible for miles which, in the great Toledo tradition, attracted spectators galore. The Blade caught up to one of the injured, 48-year police veteran Captain Albert Bernhagen, 76, a couple of days later in Mercy Hospital, where he was bring treated for his burns. He said he stepped between two houses to tell some children to move further back when the blast occurred and he felt himself enveloped by searing heat. 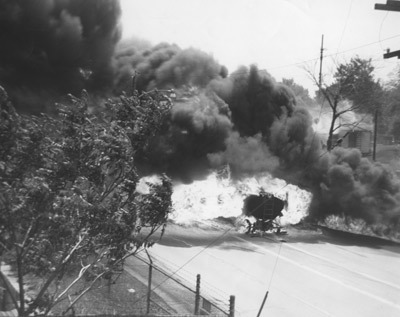 The vapor and flames looked like a tornado swirling at rooftop height (he also related his last service-connected injury in 1919, when a horse he was atop threw and trampled him after it was startled by a boat passing the Cherry Street Bridge). Police Sgt. Elwood Dernlan related how “anyone who didn’t run didn’t have a chance to escape burns or injury” after the explosion. He said he ran as fast as he could to safety, but the intense heat caused many who could not escape to just fall in the street. “It was the nearest thing to aerial bombardment that anyone could ever experience,” he said. Brandman, meanwhile, had run about 200 yards down the street. He looked back and saw telephone poles on fire and burning firemen running away. He escaped uninjured. Front page of Sunday, June 11, 1961 (click to read). Earthen banks on both sides of the Trail were scorched black by the heat and flames. Harrison, a 40-year veteran and one of the first drivers of motorized fire apparatus in the division, died a few days later. Three other firefighters, Glenn Carter, William Genson and Deputy Chief Ewald Bode, died in the following weeks. It was the largest single loss of life suffered by the Toledo Fire Division, now known as the Toledo Fire and Rescue Department. The Blade’s coverage noted that hospitals worked with cool efficiency during the incident using well-practiced disaster plans. Mercy, St. Vincent’s, Riverside were among the hospitals receiving victims. 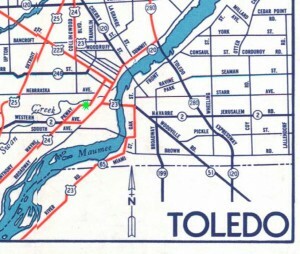 From a 1959 Ohio Department of Highways map, the approximate site of the 1961 tanker explosion (today’s Collingwood Blvd.) Click for larger. Fifty years later, I strongly suspect the bridge pictured here in Google Street View is the Nickle Plate Road bridge. This view is facing towards Logan Street, so the site of the crash would have been between the railroad bridge and the overpass (today’s Interstate 75) in the distance, since Vinton and the Trail don’t meet anymore. Technically, it’s not the Anthony Wayne Trail anymore either, it’s Collingwood Ave., but in 1961 the Trail took a hard right before crossing Swan Creek (according to the map at left). The green dot is the approximate site of the explosion. One year later, the widows of the four firefighters broke ground for the memorial that stands today in Chub DeWolfe Park downtown opposite from Station 1, and on or about June 10 every year since then, Toledo firefighters have gathered for a “Last Alarm” ceremony to commemorate those killed in the line of duty and those who have passed on. The idea of a new memorial has been considered for some time now, but hasn’t come about for a number of reasons, according to this October, 2010 story by The Blade’s Tahree Lane. When a tanker truck with 8,500 gallons of gasoline overturned and exploded at Airport Highway and Western Avenue on August 28, 1975, Chief Eulan Tucker pointed out that tight security around the area (as well as safety features built into tanker trucks and the location of the crash) prevented a larger disaster. It was a lesson learned from 1961 when then, as now, people devoted to public service were willing to risk their lives for the protection of others. I was 4 years old when this happened. My Dad & Uncle were the first arriving Fire Companies after the BLEVE, (boiling liquid expanding vapor Explosion). My Uncle W.H. Young was the #6 District Chief. My Dad Algie was his driver. It was originally Dispatched as a Still Box Alarm, Vehicle accident would get a Single Engine Company. Upon arrive made it a Regular Alarm. Getting a Full Response with a Assistant Chief. They got the 2 nd alarm immediately after first arriving company’s # 9, 1, 5 & 8 Engines were all working to lay Lines. #6 Chief & Engine Companies Approached the High Level Bridge from East Toledo. Upon reaching the top of the Bridge saw nothing. The Bleve had happened in a few short minutes. When arriving on Scene My Dad & Uncle were in Command of Incident, saw Fire fighters & Civiians with all clothing burned off walking around in a state of Confusion. Multiple House fires & in Streets & Sewers. We did not know my Dad was still alive till later in Afternoon. #6 Chief was going to Hospitals & Homes of fallen Comrades Wives & Families telling them of the Tragedy. A Day I as well as many People & Family’s will never forget. The Anniversary June 10, 2011 will be 50 years since that horrible tragedy Happened. There is going to be a Memorial service recognizing the remaining 17 Fire Fighter who are still alive. After this tragedy My Mother Alma l. Dupuis-Young with other Wives of Surviving Fire Fighters organized the Toledo Fire Fighter Wives & Widows Organization. To help in transition of Family during this time of loss. I am a Retired Sandusky Fire Fighter & Veteran of US Air Force Fire Protection. The driver of this tanker was my grandfather. This was a unfortunate accident. This was a wonderful man who enured much more than physical pain as he tried desperately to keep people away from the inferno. I was only three when this took place but I remember the scares on his body and I would say grandpa, why don’t you have eye lashes? As I got older my father told me the story of what happened that day. You can not know the emotional suffering he endured after that. I just knew him as the best grandpa. We lived at 825 Vinton St,Ron Fritch was coming home from softball practice. (Ashley Park).He was just pulling up to the house and he heard the boom.He got out of his car and ran toward the smoke.After being only a block away,he turned and ran toward his moms home. (Hazel Fritch). The heat was searing,he was burned on the back of his neck,ears and around the back of his waist.All this from 11/2 blocks from the explosion and fire.